Bethany has been riding for over 30 years and a proud owner since the age of 13. She has been teaching riding lessons and training for over 20 years. She has the ability to take students and/or their mounts from the absolute beginning to the peak of their talent. Bethany thoroughly enjoys what she does and her primary focus is always safety and believes in the philosophy that the horse comes first. During the early years of her equestrian career, Bethany worked as show groom for many trainers. She groomed at local area shows all the way to Devon as well as The National Horse Show. Bethany's style of riding, teaching, and showing reveals her strong sense of tradition in the Hunters and Jumpers with a base in Equitation and Dressage. 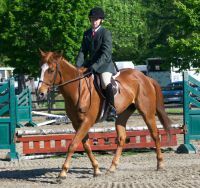 She has shown the local show series circuits such as The Sussex County Benefit Series, Smokerise, and Briarwood all the way to The Garden State Horse Show as well as The New Jersey State Fair Horse Show. Bethany feels that you are never too old to learn something new and for this reason she continues to further her education by training with Mark Leone on her Holsteiner Cross, Minister of Magic. With this education, Bethany has coached many winning horse/pony and rider combinations. Some recent accolades include Minister of Magic receiving Champion for the USHJA Stirrup Cup Zone 2 for Adult Amateur Jumper Low, Champion for the NJHSA Child/Adult Jumper section, and Reserve Champion in the USHJA Zone 2 Adult Jumper Low HOTY. Her students have received numerous awards and wins in the Marshall & Sterling point award divisions, the USHJA Zone 2 HOTY & point award divisions, the USHJA Stirrup Cup Zone 2 point award divisions, the NJHSA point award divisions, and the NJPHA point award divisions. Nothing pleases Bethany more than to see her students receive their awards and know that their hard work paid off. Bethany is available for lessons Monday through Saturday by appointment only. Fudge is an 11 y/o 16.1hh Bay Holsteiner Cross Gelding. He clears jumps with ease and is a proven Champion in the Low Child/Adult Jumper divisions and has the room to go higher. Push ride with a massive stride. Loves to please his rider. Available for full or half lease on site only. Please email for further information. 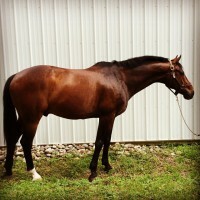 Dolche is a 15 y/o 15.3hh Dark Bay German Warmblood Gelding. Proven show record in the Hunters and Equitation. Floaty trot, auto everything, easy, smooth ride. Beyond comfortable gaits and soft jump. Available for full or half lease on site only. Please email for further information. 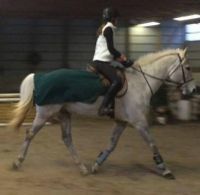 Kingsly is a 13 y/o 16.2hh Grey Warmblood Cross Gelding. 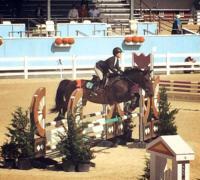 Jumper, that can also do the hunters and equitation. Extremely versatile, comfortable around 2'9" to 3'3". Available for full or half lease on site only. Please email for further information. Gambit is a 18 y/o 15.2hh Chestnut Appendix Quarterhorse Gelding. He currently does lessons and jumps up to 2'6" with 3 safe, comfortable gaits. Gambit has been shown in Starting Rider with his rider coming in Year End Champion. His riders range from the very beginner at 6 years old to the advanced adult. Available for full or half lease on site only. Please email for further information.